Who did Robohub reader’s vote for in Robot Launch 2016? 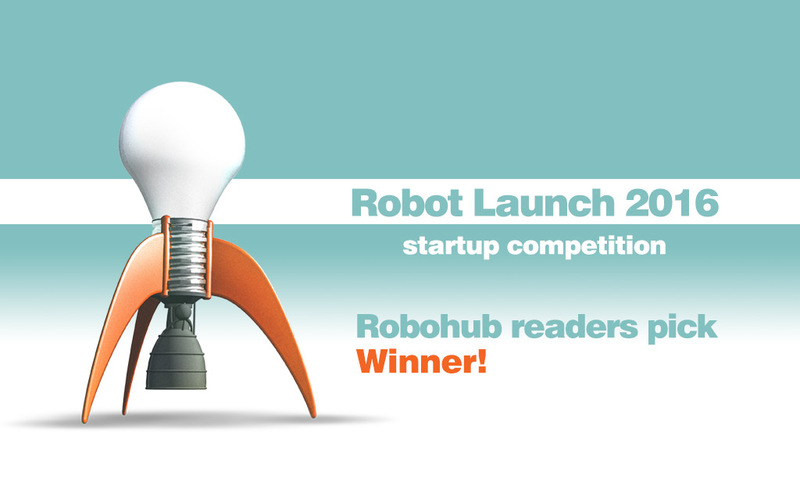 We’re delighted to announce that UniExo is the winner of the “Robohub Reader’s Pick” in the Robot Launch 2016 global startup competition. Are Robohub readers on the same wavelength as our panel of VC, investors and expert judges? We’ll find out next week when we announce the overall winners of the Robot Launch 2016 competition! The Robot Launch competition attracts early stage robotics and AI startups from all over the world to pitch their ideas in the hopes of winning investment or acceleration through mentorship and industry clusters. Robohub is an ideal venue for the competition as it reaches into robotics research labs around the world. UniExo from Ukraine wins The Robohub Reader’s Pick, after a strong campaign in their local media! Followed by: Internet of Robots, Halodi, Labs Cubed, Hibotics, Foldimate, sciRobot, Robotics Materials Inc, bridgeOS, The Virtual Robotics Toolkit and Franklin Robotics. UniExo is modular exoskeleton, which will change stationary medical equipment to mobility devices, and improves rehabilitation movements of people, without any additional help from doctors. Our product helps to save medical institutions for the purchase of medical devices. This positive effect on the quality and the period of rehabilitation clinics. Therefore people are using this device will not engage in a self-treatment. The device also allows you to keep statistics of rehabilitation that are is important for hospitals and the Ministry of Health. Halodi´s vision is to provide a vast number of robots to the mass market. We believe the time is right for Eve, a robot that is affordable for ordinary people, with strength and reach of a human. Our concept is that of simplified, but capable, and high-quality mechanics paired with a cloud “brain” that enables very advanced data processing, cross learning and continuous upgrading of the functionality. The concept of the mechanics, with our own very strong Revo1 servo motors and differential joints, means that Eve can be produced for a fraction of the cost of ordinary robots without sacrificing quality or versatility. Throughout history, we have seen how new and revolutionary materials drive innovation. Amazingly, some of our best engineers have designed solutions to major problems with energy, medicine, computers, and aerospace, but they’re missing the materials to make them a reality. At LabsCubed, we are creating a fully automated testing system to help material creators bring us all the materials of the future sooner. From 3D printing to space exploration, the materials of the future will change our lives. By revolutionizing materials testing, LabsCubed will make the future possible. The ERAD (Elevated Robotic Assistive Device) technology is centered about “mobile robotic devices that don’t take up floor space.” While floor-based mobile robots may have great potential for automating processes and assisting people (i.e. the disabled and infirm or home/industrial security), their need to navigate around objects (people, furniture, stairs, pets..) makes them expensive while still not alleviating the potential for a sense of obtrusiveness on the part of the users. FoldiMate’s goal is to save marriages around the world! We have developed a patented robotic method to fold clothes. FoldiMate is easy to use and anyone in your family can use it. Laundry will be neatly folded with consistent, high-quality folds. Foldimate will also speed up your laundry time which means more time to do the things you really enjoy. Each item can be treated with perfume and fabric softener while it is being folded, plus it also has an optional de-wrinkling system. FoldiMate will soon become a must-have in every household around the world. sciRobot is dedicated to promoting independent living and active aging. Alzheimer’s is one of the major causes of disability and dependency among older people worldwide. Family caregivers are exposed to emotional, financial and physical difficulties for about 5 years till their loved ones are moved to a care center. Research shows that regular physical activity has significant improvements in affective state, functional skills and sleep quality of the people with Alzheimer’s. Improvement in all of these areas can help ease the stress caregivers often feel from intensive caregiving duties.sciRobot is creating the activity companion robot ACRO to help Alzheimer’s family caregivers motivate their loved ones to stay more active. The Virtual Robotics Toolkit, is a STEM (Science Technology Education and Math) education tool that teaches children and adults alike the fundamentals of engineering, coding and 3D design using a simulated environment. Robots now make up $95 million USD of the $8 billion education technology market. It is our belief that the best way to engage the next generation of STEM learners is through the use of simulation technology that makes possible the opportunity to learn 21st-century skills at a fraction of the price of physical hardware. We are developing a weeding robot for home gardens. Solar powered, autonomous, and self-sufficient, Tertill maintains a weed-free vegetable or flower garden.